Editor’s Note: In June 1975, some three years after he arrived at Boston College, President J. Donald Monan, SJ, addressed a group of higher education leaders at a Boston hotel on a subject that has engaged college faculties and students for centuries: What is the purpose of liberal arts education? Monan retired as president in 1996, and has been Boston College’s chancellor since, but the question he took up 34 years ago and on several subsequent occasions remains adamantly unresolved and as neuralgic as it ever was. An attempt last January by the intellectual provocateur Stanley Fish to settle the matter on his New York Times blog—Fish supports the proposition that liberal education has no utility—elicited 544 comments in 12 hours. Monan’s talk, reprinted below, is drawn from Echoes of a University Presidency (Linden Lane, 2009), a selection of speeches delivered during his 24-year presidential tenure. The pressures that had weakened the vitality of liberal education in these institutions, we are all familiar with: pressures upward from the high schools and downward from the graduate faculties; pressures from a growingly professionalized and differentiated society in which specialized skills are a condition of entrance and mobility; and within the undergraduate college itself, the increasing specialization, departmentalization, and consequent isolation of faculty members and their offerings. Under the centrifugal pressure of departmental specializations, coherence and unity in programs of liberal education broke down, and perhaps the best that remained was a distribution requirement to guarantee at least a certain breadth to a young man or woman’s education, as counterweight to the increasing depth of his or her specialization. Bell proposed his own remedies for what he considered a sorry situation. And since he wrote in 1966, literally shelves of literature have appeared on the goals and means of communicating liberal education. Almost every treatment of the subject, however, begins as does my own, with the rueful observation that the state of liberal education is indeed in disarray. Ingenious individuals create immensely profitable courses; and by dint of extraordinary effort, professors from differing departments succeed in forging illuminating interdisciplinary courses. But the colleges themselves, as colleges, remain virtually speechless in articulating any coherent rationale identifying the purpose of their liberal education. Even if successful in articulating a collegiate purpose that is more than artful language, most major colleges must acknowledge in honesty that this philosophic unity dissolves in the hardheaded task of creating curricular programs to guarantee its achievement. I would like to affirm more, however, than the fact that American colleges have difficulty in articulating a unified rationale for liberal education, and in planning curricula to carry it into practice. I suggest that American higher education proceeds from a presupposition that makes such difficulty inevitable—and, as long as the same presupposite remains at work, inescapable. This presupposite, quite simply, is that liberal education is directed almost exclusively at the intellects of students; that it is the communication of truths and skills and habits and qualities of intellect—as though keenness and method in knowing and voluminousness in one’s learning constitutes one liberally educated. But so long as “knowledge” remains the exclusive focus of liberal education, and so long as fields of knowledge continue to differentiate and expand in specialized refinement, the more impossible will it become to select content and methods that provide a coherently liberalized curriculum. If specialization, even within the humanities, creates more highly refined knowledge, our problem can only become increasingly insoluble, our selection of curriculum more arbitrary. What is sorely needed to break out of this vicious circle is to establish a reference point outside of knowledge itself, to serve as magnetic “north” in defining liberal education’s purpose, and in setting guidelines for the curriculum to achieve it. After all, the artes liberales were originally the arts and habits befitting a person who is free. It would be difficult to overestimate the educational consequences of this simple expression of the philosophic nature of the human person and the identification of his highest good. If it is once agreed upon or presupposed that the good life of a man or a woman is a life of mind, that the highest good for the human person is the contemplation of truth, defining the goals and curricula of liberal education shifts to the universe of knowledge itself in the search for those fields and those methodologies that will best fulfill the potentialities of mind. Influential as this intellectualist conception of the human person has been in our cultures, I do not expect that upon examination any one of us fully believes it. Indeed, scholars recognize that despite the seeming clarity of Aristotle’s words just quoted, they are a radical oversimplification of his understanding of the complexity of human nature and of its true good. The notion certainly does not express the Jewish or Christian biblical view of human fulfillment. It is too narrow to embrace the insights of continental philosophies of the person, and of action, that have radically transformed our philosophic view of ourselves in the last hundred years. I do not feel I need belabor the point that in Jewish and Christian biblical tradition, the measure of a man or a woman was never to be found in the magnitude of one’s intellectual attainments. That measure was to be found rather in how sensitively, how responsively, one exercised his or her freedom. The great Commandment is: Thou shall love the Lord thy God with thy whole heart and mind and soul, and thy neighbor as thyself. Though the accents of love wax and wane, parallel emphasis on the exercise of freedom as the touchstone of human fulfillment runs from Marx to Marcel, from Blondel to Ricoeur. Granted the radical differences among each of these thinkers, the measure of personal authenticity for all is to be found in action, in the quality of one’s choices, the exercise of one’s properly understood “liberty.” Contemporary man’s philosophic view of himself has shifted from that of thinker to that of free and responsible source of initiative and of action. I believe it is time our philosophy of liberal education reflected that shift. I would assert quite simply that the final test of the civilizing process that is liberal education is to be found more accurately in the quality of choices one makes during life than in evidence of purely intellectual attainments. The specific purpose of such a liberal education should be to enable persons, to the extent that formal education can do so, to make sound human decisions affecting both personal lives and social policies. being and nothingness—but of the empty and the full, of richness and impoverishment. The critical test of human fulfillment and of liberal education is of the same order: It is no mere question of speculative knowing or not knowing, but it is a question either of richness or of emptiness of life, and these are the direct fruits of free decisions rather than of our knowledge. I want, however, to correct immediately a misunderstanding that my words could easily generate. In making certain types of choice the goal and hopefully end result of liberal education, I am not attempting to assert the greater importance of will over and against reason. Still less am I embracing some form of anti-intellectualism, or sacrificing education to pietistic or unenlightened social activism. My point rather is that the university, in its efforts at liberal education, has a responsibility toward both intellect and liberty, and that the development of each, even for the 18-year-old, is relevant to the other. Fundamentally, my position is a simple one. Liberal education should aspire, at its deepest level of intention, to educate for the enriching and constructive exercise of liberty. Without predetermining any particular curriculum, such an intention deriving from outside the universe of knowledge supplies not only a rationale for including certain disciplines within a curriculum, but a perspective that will lend distinctiveness to each discipline’s treatment. This rationale, however, is by no means rigid or inflexible in its adaptability to a wide range of alternative curricula. If it counsels some disciplines as peculiarly relevant to certain types of human choices, it invites an infinite variety of ways of making any of the humanities, the natural or social sciences, illuminating for man’s task of freedom. Before closing, I would like to make one brief observation on some recent trends in higher education that, I believe, indicate that collegiate interest in human freedom is just below the surface of the exclusive intellectualism that has framed so much of our educational theory. On every side, one hears and reads and witnesses pledges of institutional interest in values, in interdisciplinary courses, in the future. Whether or not each institution avowing these interests will have the consensus necessary to act effectively upon these pledges, one can only wait and see. But I feel certain that unless they somehow find a footing in the theory of education of institutions, they will prove no more than fads as passing as those of the 1960s. We are not, after all, very far from the days when some of our most eminent educators could insist that the university is exclusively concerned with the research and communication of knowledge, and that value considerations must be sought in other agencies of society. If one affirms, however, that constructive, enriching, and responsible exercise of freedom is the goal of liberal education, then values enter of necessity and on an equal footing with truth, into the university’s province. Furthermore, when the human person brings knowledge to bear on choices to be made in public policy or private life, insights germane to the decision usually come from a synthetic interweaving of understanding from different disciplines. Ethics, economics, psychology, political theory may all have their contribution to make in the effective resolution of a state’s budgetary crisis, to cite one example. An academic program that looks to choice, therefore, should be naturally inclined to fashion certain interdisciplinary courses that effect a synthesis of learning from diverse academic fields. Lastly, though deliberation toward human choice profits from historical experience, choice is always a not-yet; deliberation is always future oriented. For the person who would use freedom well, therefore, means should be found to make the horizon of the future as familiar and as real to him as the lessons of the past. And because human decisions, as the goal of liberal education, are both in the future and are free, liberal educators must remain modest in their aspirations—aware that the achievement of their goal depends as much on their students as on themselves. J. Donald Monan, SJ, became Boston College’s 24th president in 1972, having served as academic dean and vice president at LeMoyne College in Syracuse, New York, and as a trustee of Fordham University. In 1996 he retired from the presidency and became the University’s chancellor. For more on his new book Echoes of a University Presidency, see below. After stepping down as president in 1996, J. Donald Monan, SJ, considered penning a memoir of the transformative 24-year period in which he steered Boston College from near bankruptcy to a position among U.S. News & World Report’s top 40 national universities. But after sifting through some 300 texts of speeches in his file drawers, Monan realized there was, on those pages, a “ready-made history” of the era. This past winter, 70 selected presidential talks were published in Echoes of a University Presidency by Linden Lane Press at Boston College. 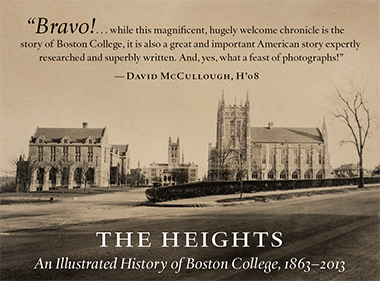 (The book is available in the BC Bookstore or via www.bc.edu/bcm.) Also drawing on his years, since 1996, as University chancellor, the collection offers a glimpse into a specific art form—the art of the occasion, of the teachable moment, within the horizons of higher education. Monan looked upon his public talks as important to “the ongoing movement of the University,” at least partly, he says, because such talks allowed members of the campus community to evaluate the thinking of the administration. The occasions that drew his observations included freshman orientations, faculty convocations, commencements, building dedications, retirement dinners, and funerals (of Thomas P. “Tip” O’Neill ’36, for instance, former speaker of the U.S. House of Representatives). Through Monan’s voice, they became moments of definition, expressing the aspirations and values that both secured and reinvented an institution of Jesuit higher education.